Jack Butala: Subdivision Magic Can Line Your Pockets. Every Single month we give away a property for free. It’s super simple to qualify. Two simple steps. 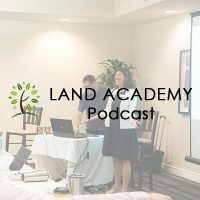 Leave us your feedback for this podcast on iTunes and number two, get the free ebook at landacademy.com, you don’t even have to read it. Thanks for listening. Jack Butala here for Land Academy. Welcome to our Cash Flow from Land Show. You know what? We can’t even … We were laughing so hard just a minute ago we had to shop the show. You’re hilarious Jill. Jill and I had this intern … Nevermind, we’ve gotta start the show. Jack Butala here for Land Academy. 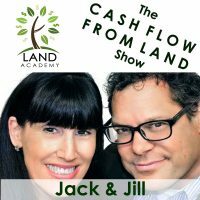 Welcome to our Cash Flow from Land Show. In this episode Jill and I talk about creating subdivided land. Jill, you already know this is my single favorite topic. Mm-hmm (affirmative). It is right now. Before we talk, let’s as always take a question from a caller. Okay. Larry from Florida called in and asked this question. I like this. This is a good question. My dad’s name is Larry, and he lives in Florida. Maybe this is him just horsing around with us. He’s retired. He’s … Go ahead. No. I … May … You know what? Maybe he did. He would do something like this. Let’s hear the question. No, that’s not my dad. My dad does not need anymore money. Yeah, that’s not my dad at all. No, yeah. Heck yes this can work as a part-time business. You’re going to get out of it what you’re going to put in … What you put into it is what you’re going to get out. I always bring up … When this comes up, I bring up Seth Williams who’s a … He’s a competitor, but he’s not. He’s a good friend and the whole thing. He’s got a website called RE Tipster. He’s a great writer and a great blogger, and he does about, he said between eight and twelve transactions a year. He makes sure that he makes ten grand on each one. I don’t know if we have any members that are vocal about just doing part-time stuff like that. Most of our members go for it. You know? That’s true. They’re replacing their income with this. Yes. It’s extremely viable to do one deal a month, make ten grand on it, and make an extra hundred grand a year because $10,000 times 12 is $120,000. So what we were laughing about is this ridiculous intern that we had for a while. Yeah, it didn’t work about. Talk about lack of ambition, Jesus. You’re a huge fan of hiring all women. Why are women so much more responsible than men. There’s a show right there. Write a … Can you write a book on that? There is a book coming on that. That’s very true. That’s just … I can’t get into it now. Women make better tenants. They’re better caregivers. What is it? Oh my God, you just lost half of our audience. Just kidding. I’m just kidding. Half of the people just turned the radio off right now. I don’t know what’s going to happen. I don’t even know what I want to do about that, but anyway, having said that, a woman can do the job. Some jobs, women do better. Huh. Think about that. Wow, look at how saucy you’re getting about this stuff. Remember that one time you took some kind of thing, like a seminar. You went to the thing and came back and said … This is what I heard. You probably said a lot of stuff, but this is what I heard. This is the only thing you took away? Professional women, like women who have a career, they ask for permission and then ask … What was that? Do you remember that? Women ask for permission, and men ask for what they want, or something like that. I think women … You should do a whole thing on … It should be called Stand Up for Yourself Woman. That’s the name of the book. No. No. No. No. No. What we think we’re worth when we really should walk in just like the men because by the way sometimes we bring more to the table. We won’t even go there, but we deserve 100 too. Hey if you have a question for us call 888-735-5045 and leave a message. If it’s actually interesting, and you seem like an interesting person, we’ll have you on the show. Jill will be the judge of it. I’ll be … No, I’m just kidding. They don’t make it to me. It doesn’t make it to me. I guess the questions make it to me. All right, back about the subdivision. It’s a license to print money. Here’s why. There’s two types of subdivisions in the world. One that was modeled after a, let’s call it a Ranch Farm Model, where you take a big piece of property, and then you want to give part of it to your son or your daughter or you daughter-in-law, so you just carve it out. You have one APN. Picture a farm that’s got one APN. It’s a big huge piece of property. Assessor’s Parcel Number. You want to cut out 40 acres and give it to your brother-in-law. You can subdivide it, basically by rewriting the legal description, northeast quarter, southeast quarter. I don’t want to get into that right now because it’s boring. It is boring. Do you see my eyes glossing over. I do. That’s how you do. Those are the kind that we like. The second type of subdivision is the one that you live in, where you take a big piece of property, and you cut it up and put roads in there. I’ll call that an entitlement subdivision because you have to, at least out here, apply for entitlements. You have to get … It’s called getting entitlements to do a sub. We care about the first. You can take a 40 acre property in Arizona, and if you cut it into five properties, not six, six is whole different ball game. It has different rules and everything, but you can cut it into five properties and create five APNs and print money. One of our members said it like this, buy it by the case and sell it by the bottle. Is it without paperwork and is it without hassle? No, but you do the math. You’re going to make three or four times more money than you would if you just bought the 40 and sold the 40. I’m just using 40 as an example. That’s a good number to work with. What I love too is because nothing’s too small. You still got a nice big 20 acre, that’s awesome. You could probably sell that 20 acre for what you bought the whole 40 … You make money off the 20 already, make your investment back off that 20. It’s still a fantastic size, and you bought it right, by the way, or you wouldn’t be doing this. Then the 10 and the 5, all these other ones are gravy. You know what you’re doing. It’s making land Steven. You’re creating new … The county will love it … I’ve heard you say this. It’s a … There’s more properties to collect taxes on. Now you have instead of one APN and one tax bill, you have five. It’s a win-win for everybody. It is. Maybe I can’t afford the 40, but I can afford the five. I don’t want the 40, I only want five. The name of the first education program that we did it was called, “$10,000 a Month for Life Cash Flow from Land.” That’s the full title. The ten grand comes from collecting payments. You pay cash for properties, this is what we do here. We buy property for cash and then we sell it on terms, or we sell it for cash depending on the property. Now you’re making … You’re collecting five payments instead of one. Who the heck can argue with this at all. It’s the best thing ever. You could easily have a $1,000, period, on that one transaction. Jill regularly buys 40 acres properties for less than $4,000, and we cut them up. It’s not without effort. I’m telling you, that’s beyond the scope of this show, and very municipality is different, and some flat out, even though the law says you can do it, some flat out don’t like it, and they don’t want you to do it. They will tie it up forever. We should write a whole book on this. Right. Here’s what I’m thinking, you could sell … I could easily get … On a 20 acre property, I could easily get 250 a month in payments, seriously. 250, 150, 100. $100 a month. Think about this, I could be making $1,000 a month easy in payments on this one property. Right, that I spent … Even say I bought it for five. Who knows, five months I make my money back. I would love to see a better business model than that. Right. Then it’s just gravy after the few months. You can’t do this with every property, but you don’t want to buy every property anyway. You’ve heard us talk about this. No we’re not. We’re not. Exactly, no. You don’t buy it. If you can’t do that, you don’t buy it. You can’t subdivide property anyway … I’m telling you right now, anywhere without really good access. Even if you have to create access, and there’s nothing wrong with that. There’s nothing wrong with creating access. We do it all the time. I … Yeah. We were looking at some properties yesterday where you could see the strategic … I was like whoever did that road design was brilliant. There was a drive right up to it for every parcel, and it kind of snaked through the property, and it was efficient. I’m like, that was brilliant for that property. There’s guys that live in rural locations that have those big caterpillar blade things. It’s called blading roads in, and that’s all it takes. They are happy for their work, and it’s way less expensive than you think. I did it in Nevada once. A huge subdivision in Nevada. Made just a killing on it. Mm-hmm (affirmative). Once you learn one, you’ve got this. Once you learn how to do it, you know that state, that county, whatever, you’ve done it, and you’ve made all the connections by the way. You want to pick an area that there are multiple properties that you could probably do this with. You know what I mean? You’re going … You’ve already made all of the friends. We have no affiliation with this company, but if you go to arizonaland.com, just like I said it, and look at their business model, this is all they do. They take thousands and thousands of acre properties, and they cut them up into 40 acre properties and sell them on terms. They maintain the roads and charge an HOA, and the whole thing. They do a bang up job. I have multiple people throwing money at us right now to go do this. We just need to find the right partners. Jill and I don’t have enough to do. We need a partner that will handle this whole thing, and deposit the money where we tell them. If you’re a person like that let us know. We have the land, and we have the money. We have no time. I’d rather do this show than do that. I know. We need one more person. Maybe my priorities are wrong. Maybe your priorities are wrong. Maybe we should stop teaching people stuff, and just make hoards of money and never say a word on here ever again. Yeah, that’s a good idea. No. We did that. Now we teach people. That’s where we started because people were asking us for it. Right. The whole big picture is we’ve been doing this for years anyway, just not at this level. It got to the point where we couldn’t possibly help everyone who asked for our help. We finally said all right, we’re going to put together a program, and that will teach everybody, and then look what that grew into. Talk about fun. I’m having so much fun now. 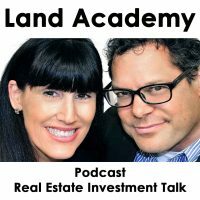 We do so many more real estate deals now because we have Land Academy than we did before. We weren’t suffering before, trust me, but … It lends a lot of credibility I guess. I don’t know. Who knows why. People are making a lot of money. People are quitting their jobs. They’re making enough money to quit their jobs as members. It’s awesome. I agree. It’s awesome. It is. I love it. Do you have anything more you want to say about the subdivision magic? No, if I didn’t say it already, I love subdivisions. 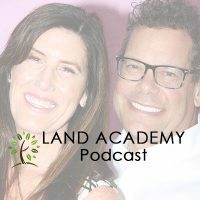 Hey, join us in another episode where Jill and I discuss your all important success in subdivisions, real estate, and in life. You could take that, that’s what you could do for a living. Totally. That’s all you do. Just that one thing. The guys at Arizona Land, that’s all they do. No they have 50 people working there. All sales people. You know what they do? They sell properties to people in Asia. They speak Mandarin, and they call them. I don’t know. I just … I know these guys. I have a lot of respect for them. I’m like, how do you know … That’s very interesting. Hmm. Most billionaires per capita are in Shanghai or something like that. I did hear that this morning on the news. Yeah because you know what? No, it’s China, but I don’t know if it’s Shanghai. It’s Beijing. That’s what it is. Yeah. She made a joke about, “I know where I’m going.” She’s like joking … Now it’s Gail and Mr. Wong. She said that on the news. I’m like oh that was awesome. On her show with Charlie Rose and Nora. It’s so funny. That’s what she said this morning. It was really good. I believe it. I’m pretty sure I could sell stuff to Chinese people. There’s another … Anyone listening? We need another person now to head up that whole project. If you speak Mandarin give us a call. Let’s go buy some subdivisions.